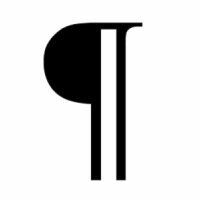 The paragraph sign (or pilcrow) is a typographical symbol used to indicate the start of a paragraph. A paragraph break is a single line space or an indentation (or both) marking the division between one paragraph and the next in a body of text. It is also known as a par break. Paragraph breaks conventionally serve to signal the transition from one idea to another in a stretch of text, and from one speaker to another in an exchange of dialogue. As Noah Lukeman observes in "A Dash of Style," the paragraph break is "one of the most crucial marks in the punctuation world." "In ancient times there were no paragraphs—sentences simply flowed into one another without interruption—but over time text became segmented into paragraphs, first indicated by the letter 'C.' "
During medieval times, the mark evolved into the paragraph symbol [¶] (called a pilcrow or a paraph) and eventually became the modern-day paragraph break, which is now indicated by only a line break and indentation. (By the 17th century, the indented paragraph had become the standard paragraph break in Western prose.) The indentation was originally inserted by early printers so that they would have space for the large illuminated letters that used to herald paragraphs. Today, the paragraph break is used not for the convenience of printers but to give readers a break. Paragraphs that are too long leave readers with dense blocks of text to wade through. To fully understand when to insert a paragraph break or paragraph breaks, it's helpful to know that a paragraph is a group of closely related sentences that develop a central idea. A paragraph conventionally begins on a new line. Paragraphs are generally two to five sentences—depending on the type of writing you are doing or context of your essay or story—but they can be longer or shorter. The art of creating paragraphs is called paragraphing, the practice of dividing a text into paragraphs. Paragraphing is "a kindness to your reader" because it divides your thinking into manageable bites, say David Rosenwasser and Jill Stephen in "Writing Analytically." They add, "More frequent paragraphing provides readers with convenient resting points from which to relaunch themselves into your thinking." Paragraphs used to be longer, but with the advent of the internet, which gave readers access to literally millions of sources of information from which to choose, paragraphs have become increasingly briefer. The style for this website, for example, is to make paragraphs no more than two to three sentences. "The Little Seagull Handbook," a grammar and style reference book widely used at many colleges, includes mostly two- to four-sentence paragraphs. "Despite the criticism, North Korea’s Foreign Ministry said the country’s leader, Kim Jong-un, still wanted to build on the 'friendly relationship and trust' forged with President Trump during their summit meeting in Singapore on June 12. The ministry said Mr. Kim had written a personal letter to Mr. Trump, reiterating that trust.​"
"The two sides have a history of veering between harsh talk and conciliation. Mr. Trump briefly called off the Singapore summit meeting over what he called North Korea’s 'open hostility,' only to declare it back on after receiving what he called a 'very nice letter' from Mr. Kim." Note how the first paragraph contains a self-contained information topic: that despite some kind of criticism (described in the opening paragraph of the article), there are two sides involved in denuclearization talks and at least one of the sides, North Korea, wants to retain friendly relations. The next paragraph is joined to the first with transition phrases—the two sides and the letter—but it covers a totally different topic, the history of tense relations between the two sides. The paragraphs are also roughly equal in size—they are both two sentences long, while the first contains 52 words and the second is made up of 48. Breaking up the paragraphs in any other way would have been jarring to readers. The first paragraph clearly refers to the present situation between the two countries, while the second talks about their up-and-down history. "However, much will depend on the style of the publication or document and on the column width. For news-style print jobs, using double or multicolumn format, paragraph breaks are usually needed after every second or third sentence—say about every 50 to 70 words." Foster says that for single-column reports, books, manuals, leaflets, and brochures, it is usually better to have slightly longer paragraphs with perhaps four or five sentences. Much depends on the context, your audience, and the medium in which the work is published. If you remember that each paragraph should discuss one unified topic and that you should use a paragraph break before each new topic, your writing will flow and you'll help the reader proceed through your writing in a logical fashion and without straining to get to the last line.